His house is a humble fortress. Its thick walls of stone and mud and its few small shuttered windows offer sanctuary from wind, rain, and snow. To the north, steep slopes of grass and rock flank a ridge that climbs to sheer Himalayan faces, ice-clad pyramids and domes that are often shrouded in clouds. To the south, a low outcrop conceals views of the dreamlike Jarchu Valley, where his yaks – hundreds of them – graze the floodplain among the serpentine, ox-bow bends of a river that flows from a glacier. At approximately 15,300 feet above sea level, this place – called Nyima Ten – feels just shy of the end of the Earth. In fact, it’s situated in the northernmost reaches of the Indian state of Sikkim, about eight miles from the frontier with Tibet. The man who owns the yaks, who makes his summer home at Nyima Ten, is named Ugean. About seventy-five years old, he easily breaks into a smile, showing the slight gap between his top front teeth. His sculpted face and weathered hands are a rich shade of mahogany, but his arms – which are rarely exposed to the elements – are so much lighter, they’re closer to the color of oak. Despite the hardiness of body and spirit that’s required to live deep in the Himalayas, far from the reach of modern amenities, his demeanor is gracious and gentle. Ugean is one of Sikkim’s last Dokpas – ethnically Tibetan high-altitude nomads who migrate seasonally with the yaks that they herd. During the course of his life, he has seen his people virtually vanish from the mountains. Today, he says, just 21 families remain, most of which consist of just one or two people, plus their animals. Ugean himself lives essentially alone, managing some 400 yaks. And he is one of the very few Dokpas who have any memory of what their world was once like, before everything changed. For centuries, Dokpa migration routes spanned the rugged frontier between Tibet and the Kingdom of Sikkim. Their transnational existence persisted until the early 1960’s, by which time Tibet had fallen under the control of China and Sikkim had entered into a special relationship with India, retaining its independence (until 1975) but relying on India’s army for its defense. Many Dokpas - who are also known as Doksas or Drokpas - liked to spend summers in North Sikkim, where the alpine valleys provided rich grass for their herds. They’d retreat to Tibet in winter, when the Sikkimese valleys would be buried by snow. Meanwhile, as the masters of this difficult terrain, the Dokpas dominated the region’s trans-Himalayan trade, running goods between Tibet and Sikkim and guiding merchants, travelers, diplomats and pilgrims over the mountains. But when hostilities between India and China broke out in 1962, when Ugean was twenty years old, the previously porous border between Sikkim and Tibet was sealed. Troops began monitoring the frontier and land mines were planted along it. Those Dokpas who happened to be on the Sikkimese side of the line were stuck there, their migration and trade routes severed. They didn’t panic, assuming that after a short period of time, once tensions died down, they’d go back to doing what they had always done. And they were wrong; the border remains closed, tightly, to this day. No longer able to access Tibet, life for the Dokpas in Sikkim, which was never what one would call easy, became increasingly challenging. With the demise of their trading operations, the lifeblood of their economy ceased to flow. Their nomadic range was drastically reduced in size, yet they still had to move seasonally with their yaks. Since the valleys – which sit between 14,000 and 16,000 feet above sea level – catch and hold snow, by the end of October most Dokpas shift to pastures at around 18,000 feet, where the terrain is flatter and the wind is so fierce it blows the snow off of the ground, revealing just enough grass for the yaks to survive. In May, the Dokpas descend again, as the snows melt and good grass once again emerges in the valleys. They are the rare group of pastoralists who migrate to higher altitudes in winter and lower altitudes in summer. The Dokpas lost more than just grazing territory. Sacred Tibetan Buddhist sites are beyond their reach, and they can’t gather with their brethren across the border to celebrate religious festivals. In addition to being significant spiritual and cultural events, festivals provided an important opportunity for young men and women from families normally dispersed across the vast countryside to meet and find potential spouses. Likewise, families would trade yaks and sheep of different lineages, refreshing the gene pool within their herds. Once the border closed, both people and animals had far fewer possible mates. Other, previously unimaginable problems eroded their general sense of well-being and continue to make their day-to-day existence more difficult, from watching their yaks get blown up by land mines to being oppressed by the majority Lachenpa population, which rules the region to which the Dokpas are confined. Thus, when Tibet’s government-in-exile – which is based in India – offered Dokpas homes in Tibetan settlements in other parts of the country, beginning in the 1980’s, they gradually began to give up their nomadic ways and relocate to towns such as Ravangla, in Sikkim, or to South India. Others pursued new lives in Sikkim’s capital city, Gangtok. Some Dokpas held on to their nomadic ways as long as they could, letting go only when they had no other choice. Ugean’s older brother, Tsering Galpo, the Dokpas’ leader for over a decade, had to abandon life in the wilderness after an illness he suffered in 2012 caused him to become partially paralyzed on his left side. 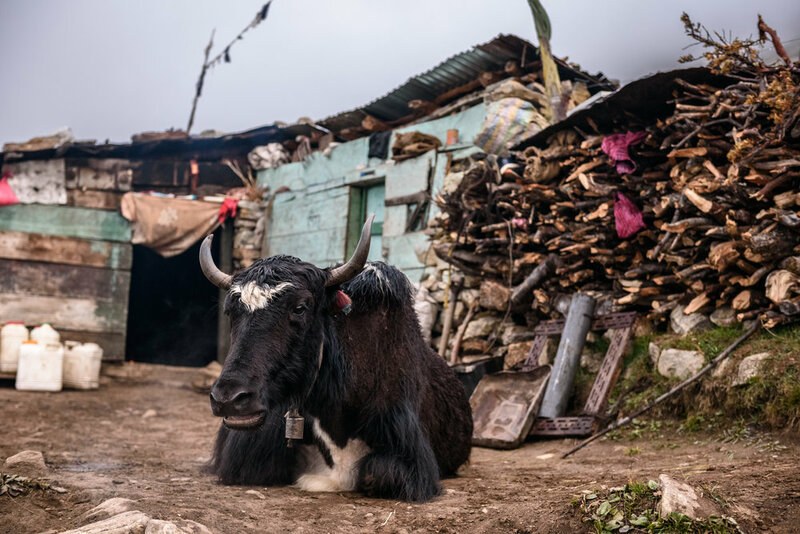 Unable to live and move with his yaks, he settled into a house in the northernmost village in the area – Thangu – which is just a ten-mile trek from Nyima Ten and is surrounded by the Quonset hut hives of Indian Army bases, some 13,000 feet above sea level. As is common among Dokpas of their generation, the brothers share a wife, named Yanzon, and she went with Tsering Galpo, to care for him, leaving the animals with Ugean. Though she was 79 years old, Yanzon wouldn’t have retreated to Thangu without a compelling reason. Living in the mountains is hard, she concedes, but she was happy that way. “I raised the yaks like my own children,” she says, and seems wistful as she recalls going outside in the middle of the night to protect her herd from Tibetan wolves, using her voice to try to frighten the predators away. Tsering Galpo, in his sickbed in Thangu. Those families who stayed in the highlands began sending their children off to Tibetan boarding schools in places like Darjeeling or Varanasi, and as far away as Bangalore; today, no school-age children remain in the mountains, and no one expects them to return once they’ve received an education and become acclimatized to the comforts of civilization. By all accounts, the current generation of yak-herding Dokpas will be the last. 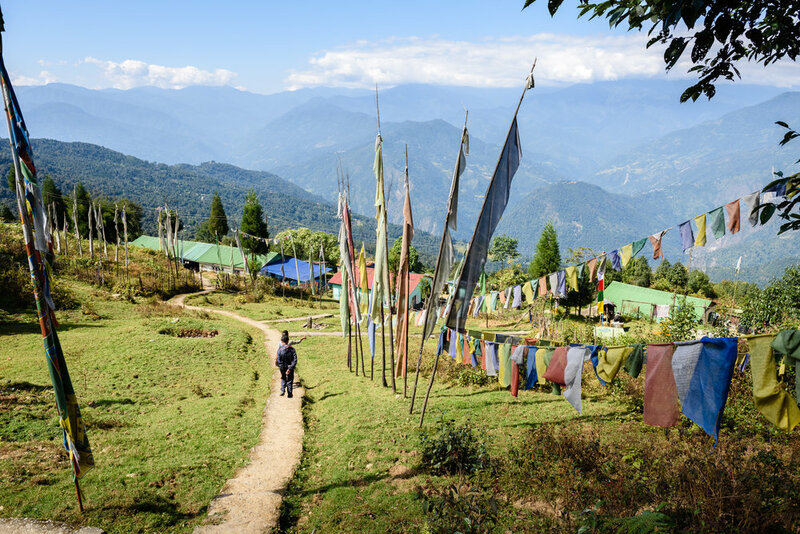 Far from the snowy peaks and the frigid winds, far from Army patrols and Tibetan wolves, the town of Ravangla sits amid the lush hills of South Sikkim. In the Tibetan colony that’s been established there, about 20 Dokpa families live in a section called Camp 6. Far, of course, is a relative term. As a crow flies, Ravangla is only fifty or so miles from where the Dokpas roam in the Himalayas, but it’s 8000 to 10,000 feet lower, and to travel between one place and the other takes two to three days. Surrounded by verdant forests, tea estates, and the popular Tathagata Tsal Park, which features a 128-foot high statue of the Buddha, Ravangla feels like it’s in a very different part of the world – one that is much, much easier. At Camp 6, houses with gardens are perched on a hillside, with unobstructed views of the mountains and valleys that stretch to the jagged horizon. Colored flags, called lungta, flap on poles: blue for sky, yellow for soil, green for grass, and red for fire. Here, there are a few Dokpas old enough to remember something of the days when they traveled freely between Sikkim and Tibet, and what it was like when the border closed. 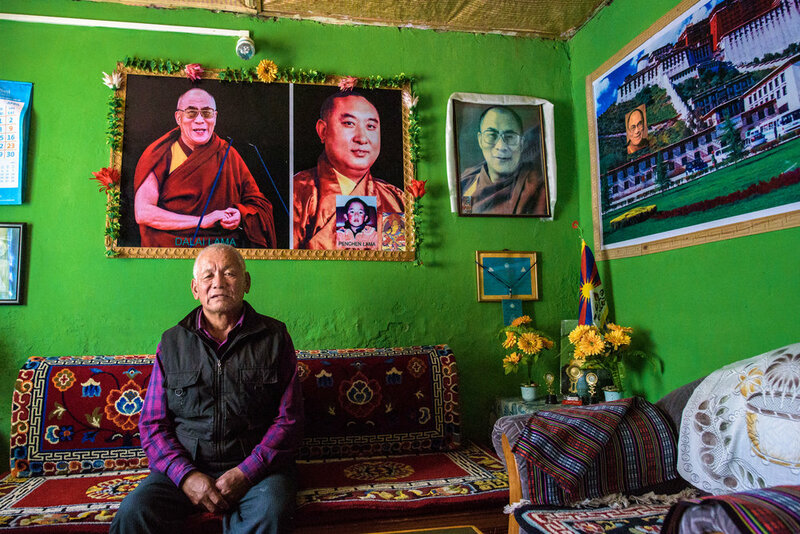 Gelik was born in Tibet in 1947, and one look at the living room of his house in Ravangla settles any question as to his attachment to his homeland. A Tibetan flag stands in one corner. 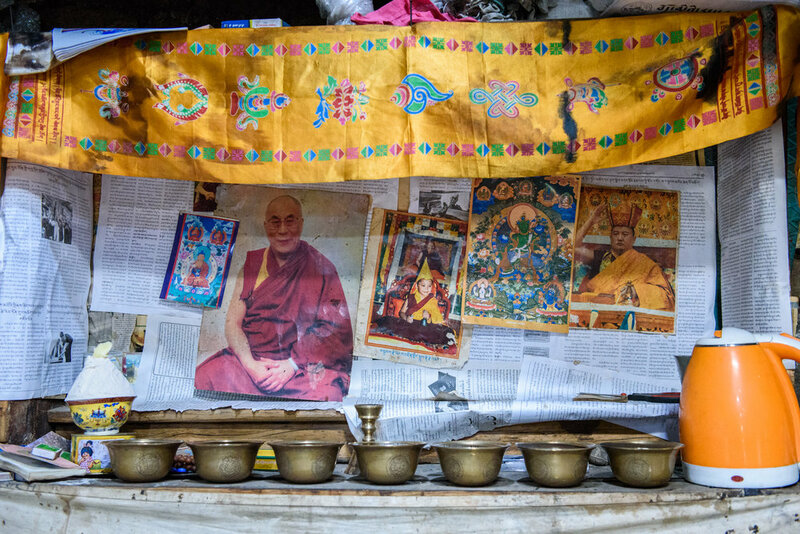 The lime-green walls are covered with pictures, including several of the Dalai Lama, a large poster of Potala Palace in Lhasa, and a large portrait of the 10th Panchen Lama. There’s also a snapshot of the child who was divined by the Dalai Lama to be the 11th incarnation of the Panchen Lama in 1995 – only to be “disappeared” three days later by the Chinese government, which installed a different boy in his place, seeking to control this most vital aspect of Tibetan religious and cultural tradition. When Gelik was a boy, his family spent winters in Tibet, moving south to Sikkim in summers, herding yaks and sheep. When the border closed, he says, they weren’t given a choice about which side of the line they would ultimately live on for the rest of their lives – wherever they happened to be at the time, that’s where they stayed. Stuck in Sikkim, his family believed that the border might re-open after the immediate bout of saber-rattling subsided, so they didn’t feel the need to try to sneak into Tibet. Besides, Gelik says, it was too dangerous to consider seriously. The Indian side of the line swarmed with soldiers and policemen who threatened to jail the Dokpas if they attempted the crossing. And if they happened to successfully make it to the other side, there was a good chance that they’d be caught by the Chinese, who were said to torture anyone they captured. Gelik's wife. Tsamchuk, says that when they were living in the mountains, Dokpa women took care of the baby yaks, did all of the milking, and made butter and cheese. They focused on tasks related to the home and kitchen, while the men did more physically demanding work outside. Today, there are too few Dokpas in the mountains to divide labor along gender lines - men now do everything that women once did. Tsamchuk misses the yaks, and the scent of the tsang bushes - but prefers life in Ravangla. Gelik’s neighbor in Ravangla, Kusang – whose own living room featured a nearly life-sized image of a grazing yak on one wall – elaborated, saying that the confusion over the border situation was exacerbated by the fact that the Indian troops stationed there, from the Assam Rifles paramilitary unit, spoke Hindi, not Tibetan. The soldiers, he said, roused much less fear than the Indian Intelligence Bureau, which was on the lookout for spies, and had supposedly co-opted some Dokpas to keep an eye on other Dokpas and report who was coming and going over the border. Even law-abiding Dokpas in Sikkim had inevitable run-ins with the military. Their yaks, which were used to crossing the border, naively meandered beyond it on their own. Getting them back was the first problem – and once land mines were placed, the unwary animals wandered among them, blowing themselves up. Kusang came from a family of high-altitude merchants, who carried sugar, rice, cloth, and wood to Tibet, returning with sacks of tsampa and salt, and yak-skin drums and yak wool goods. In those times, they bartered for everything they needed, he said, which became much less feasible once they were stranded in Sikkim. They also rued the loss of relatively easy grazing in their traditional winter pastures. Both Kusang and Gelik spent the next two decades in the Muguthang Valley, which was beautiful and lush in the summertime, and often overwhelmed by snow in winter. They learned to harvest and store grass, but sometimes even that wasn’t enough. During a particularly hard winter in the early 1980’s, Gelik lost most of his herd – over 100 yaks – giving him little choice but to leave the mountains and move to Ravangla, where he eventually opened a shop selling ready-made clothes. Kusang's wife, Pasan Kipa, outside their home in Ravangla. Some of those rituals had already changed when the border closed, Kusang said, as they practiced sky burial in Tibet, while in Sikkim they cremated corpses with fire from the wood of tsang bushes. As for Gelik, he said that life in Ravangla was good, and was happy that Dokpa children could now go to school. But he missed Tibet profoundly. “Chorten Nyima is in my country,” he said wistfully, referring to a sacred pilgrimage site over the border, whose healing waters are said to be able to heal any illness and cleanse any sin. He still yearns to go back one last time. Yaks were first domesticated some 10,000 years ago, most likely by the ancient Qiang people who lived on the Tibetan Plateau, and the Dokpas are among their modern descendants. As the camel is perfectly fit to survive in the great deserts of the world, so is the yak adapted to high altitudes and frigid temperatures. They are built to conserve heat, most obviously thanks to their thick fleece, which includes an outer coat of long, coarse hair and a downy undercoat. Though imposing, yaks are compactly-built, with less heat-losing surface area per pound of body weight than other cattle, and they have a layer of subcutaneous fat for extra insulation – though their meat is surprisingly lean. Their large chest, lungs, and heart, along with specialized hemoglobin in their red blood cells that enables them to retain oxygen better than most other animals, compensates for the relative lack of oxygen in the air that they breathe. Their small, sharp hooves provide exceptional stability in mountainous terrain – making them more sure-footed than horses or even sheep. And they have no problem swimming across rivers or marching through snow. To the Dokpas, everything about the yak is useful, from their wool (which is typically referred to as ‘fiber’), to their milk and meat, to their dung – which is the primary source of fuel for these herders who often live above the treeline. Of equal importance is their strength, which allows them to carry heavy loads over great distances. Yaks on their way to Thangu to get supplies for the army base in the Muguthang Valley, which is behind the mountains in the background. With the trans-Himalayan trade long extinct, the Dokpas still living in the mountains today raise yaks for the food they provide, which they consume themselves and sell to others. (Though technically only the males are called yaks, while and the females are called dri or noh, we’ll be using ‘yak’ to refer to both). 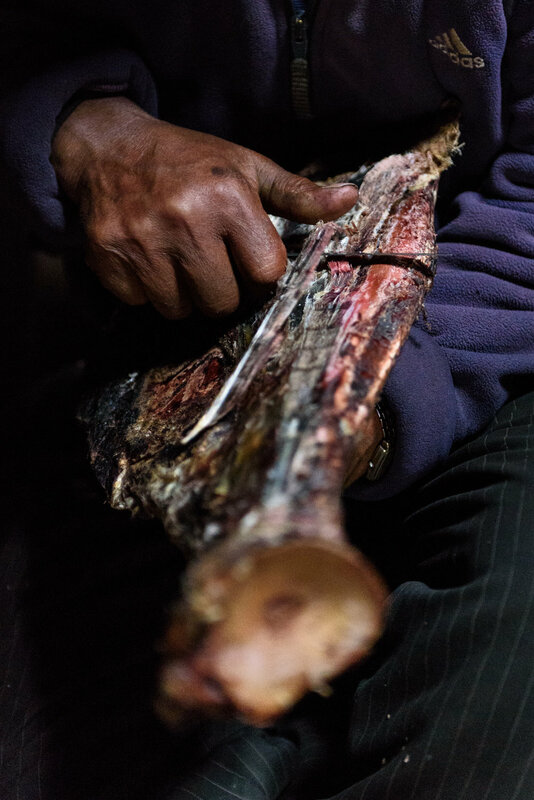 Though yak meat is the Dokpas main commodity, cheese – called khamo -- and to a lesser extent, butter, accounts for an important part of almost every family’s annual income. 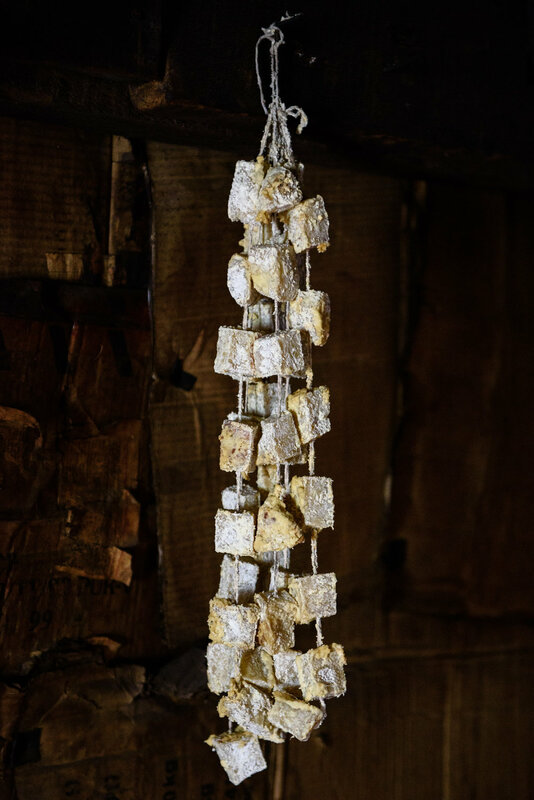 Dokpa cheese, as it is typically kept. Summertime is dairy season, as the abundant grass that grows then allows the yaks to produce substantial amounts of milk. Since working it into cheese and butter is a labor-intensive process and many Dokpa herding families have shrunk to just one or two or three members, many feel shorthanded, unable to produce the quantities they once could while pushing themselves to make what they can. Some Dokpas who have settled elsewhere return to the high country to lend a hand. Samten Doma lives in Ravangla during the winter, then joins her husband, Dugya, and their yaks for the summer. She was already with them in May, at a place called Thoktanglaka, which is little more than a bench on the side of a serrated ridge, with huge views of the mountains across the Diu Thang Valley and easy access to the steep meadows that rise above their camp. They stay here for about a month, in a simple shelter with stacked-rock walls and a translucent plastic roof, before moving to the alpine pastures at Phalung. From there, Dugya will move even higher, towards his winter base camp near Lake Gurudongmar, while his wife will retreat to Ravangla. Dugya outside the shelter he shares with Samten Doma at Thoktanglaka. Dugya inside the hut, making a yak-hair rope. Now in her mid-fifties, Samten Doma accepted a home in Ravangla due in large part to health issues. For someone who is unwell, she says, “winter is too tough in the mountains.” And she has mixed feelings about spending summers there. Wearing camouflage-patterned plastic boots and a knockoff sweatshirt imprinted with the Kappa symbol – two naked women sitting back-to-back, typically seen on the mudflaps of American trucks – she explains that about one-third of the 150,000 rupees (about $2300) they usually earn each year comes from selling cheese, so she has to go up to help. She also loves being with the yaks and misses Dugya when they’re apart. They’ve known each other since childhood and have been married for about thirty-five years. He fell for her because she was beautiful. When he proposed, “I didn’t really think too hard about it,” she said. “He asked, and I said yes.” To seal the union, his family gave hers one yak leg, some wine, and a white khada (welcome flag), as in their tradition, the groom’s side provides a modest dowry. Once married, husband and wife live and work together as equals, and their herd belongs to them both. Though in the past, women commonly had two husbands – usually brothers – Dokpas no longer practice polyandry. Which is fine with Samten Doma. Samten Doma feeds salt to young yaks. Tying up the young yaks for the night. Muzzling the young yaks, so they can't milk when they're not supposed to. 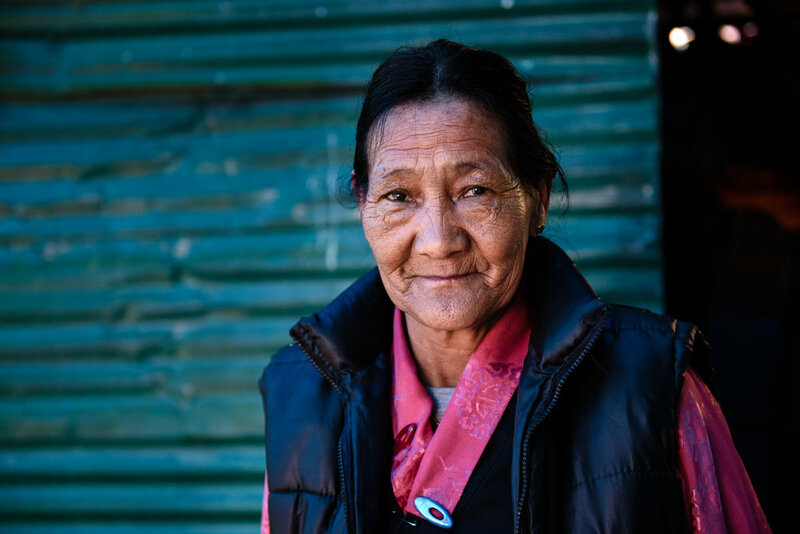 With all of the hardships that became part of Yak World following the closure of the border, virtually all Dokpas say that their relationship with the Lachenpas are what have made their Sikkim-bound lives most difficult. The Lachenpas rule the upper Teesta River Valley and the mountains on either side of it – which includes the Dokpas’ territory – under an ancient system, in which decisions are made by a council called a dzumsa, which is headed by the pipon, based in the town of Lachen. Recognized as a legitimate autonomous government by the Kingdom of Sikkim, the authority of the Lachen dzumsa over the area has been validated and protected by the Indian government. It has a virtually free hand in setting local laws. It is often praised in studies of the area as an indigenous form of governance that promotes living in harmony with the natural cycles of seasons, but the Dokpas experience it as a tool of oppression through which Lachenpas exert their dominance over them. Dokpas have a list of grievances against the dzumsa, chief among which is the control that it imposes over how Dokpas sell their livestock. The dzumsa has decreed that Dokpas can only sell yak meat to Lachenpas, and they’ve fixed the price at 36,000 rupees per yak. Fair market price is somewhere between 50,000 – 60,000 rupees and, while some Lachenpas keep the meat for their own consumption, others, the Dokpas say, take it to market themselves, making a tidy profit on the Dokpas’ hard work. If Dokpas are caught taking meat to Gangtok themselves, they are fined 500 rupees per kilogram of meat that they’re carrying. The Lachenpas say that these restrictions weren’t established to take advantage of the Dokpas, but to protect themselves from being gouged by them; if they didn’t fix prices, the Dokpas would charge so much for their yaks that no Lachenpa would be able to afford to buy meat, and the Dokpas wouldn’t care because they could simply sell in the city, where prices are higher. But money may not be the only reason behind these rules – according to some Dokpas, the Lachenpas’ other intent is to make it more difficult for the last of the Dokpas to sell off their herds and leave the mountains forever. If they did, the Lachenpas would lose their source of yak meat, as well as the free herding services for Lachenpa-owned yaks that the Dokpas provide, especially in winter. On one hand, Dokpas don’t want to liquidate their herds at cut-rate prices, and on the other, even if they tried, they’d have a hard time doing so, because they have so many more animals than the Lachenpas would ever buy at any one time, and Dokpas aren’t allowed to sell to anyone else. “It’s always been like this between Lachenpas and Dokpas, with the Lachenpas keeping the Dokpas down,” said Gelik, in Ravangla. Gya, inside his hut in the Lashar Valley. Three of his six children died from illness. Now, his only son is studying in Gangtok, one daughter serves in the police force in Bangalore, and one daughter has chosen to stay with him and his wife and their yaks. She's the rare individual from her generation who prefers traditional Dokpa life. Gya's wife is a Lachenpa by birth, but she now identifies as a Dokpa; Lachenpa/Dokpa intermarriage is not uncommon. 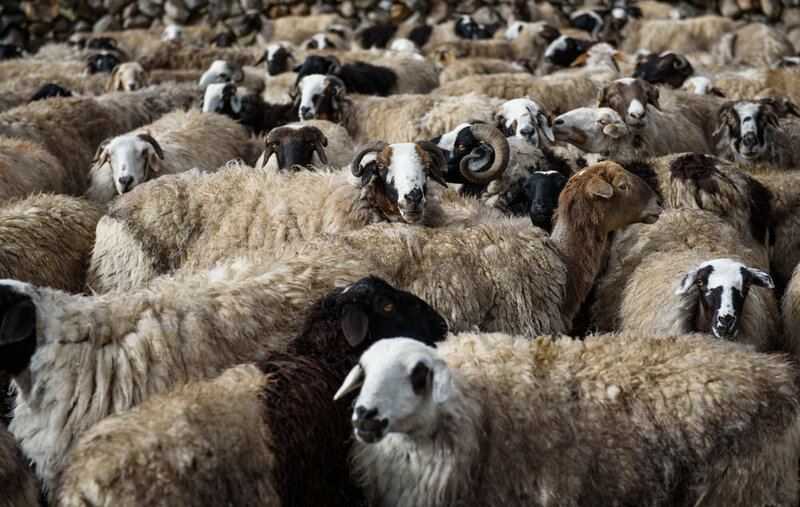 Rules laid down by the dzumsa were a major contributor to the end of the Dokpas’ centuries-old practice of herding sheep. Sometime in the 1990’s, the dzumsa decreed that Dokpas could only sell sheep to Lachenpas, at fixed prices. Then in 2008, it was decided that for the following three years, Dokpas would not be allowed to sell or kill any sheep, nor – as one Dokpa put it – “use their meat or hide in anything.” Once the moratorium ended, the earlier sales arrangement would remain in place, with sheep prices fixed at 1800 rupees per head – while market value was about 16,000 rupees. Tibetan sheep, once kept in greater numbers than yaks by Dokpas. There are several, very different, reasons given for the three-year ban on sheep sales. Researchers from the Bangalore-based Ashoka Trust for Research in Ecology and the Environment offer the explanation that’s most generous to the dzumsa. According to Tenzing Ingty and K.S. Bawa, Dokpas had begun giving up on sheep, focusing instead on yaks, as a way of adapting to the negative effects of climate change on their pastures. The dzumsa, the authors write, had noticed this decline in the size of Dokpa flocks, and chose to intervene in order to save the sheep. A three-year ban would, the dzumsa reasoned, provide enough time for the flocks to rebound. “Their intention was for the longterm betterment of that activity,” Ingty believes. But, he adds, “The consequences of any decision” are not guaranteed. In this case, if the goal truly was to strengthen sheep populations, a serious miscalculation was made. On the opposite end of the spectrum is the story related by a respected Gangtok-based journalist who has covered Dokpa-related issues over many years. According to Pema Wangchuk, the sheep moratorium was a punishment imposed on the entire Dokpa community after some Dokpas were caught trying to sell sheep directly to non-Lachenpa buyers. Tibetan sheep, as flurries fall on North Sikkim. Dokpas themselves experienced it as a mean-spirited power-play by the dzumsa. Though, historically, most Dokpas had kept more sheep than yaks, this convinced them that it was no longer worth it, and virtually all of them liquidated their flocks soon after the ban was lifted, slaughtering them and then smuggling the meat down to Gangtok (and some had sterilized them during the ban). Today, there is only one Dokpa remaining who herds sheep. His name is Singhe, and he’s the son of Ugean, Tsering Galpo, and Yanzon. Singhe spends most of the summer 15,500 feet above sea level, at Phalung, a meadow shaped like a bird’s head peering out from beneath the imposing walls of snowy Kangchengyao, which scrapes the sky at 22,602 feet. Fortunately, his nang – Tibetan for ‘home’ – is only about one kilometer away from his father Ugean’s house at Nyima Ten, making it possible for him to look in on the older man on a daily basis. Singhe holds his sheep in a shoulder-high pen with rock walls and a handful of rusted, dented gas cans that he stacks together for a gate. Every morning, he takes the flock – some seventy strong – on a day-long walkabout, grazing over burly slopes until returning shortly before dusk. “Sheep are difficult to keep,” he says. “They need to be watched all of the time, because of predators like wolves, and birds,” in contrast to yaks, which may be left to graze unsupervised for substantial periods of time. He carries a slingshot over his shoulder, with which he can hurl rocks at any unwelcome visitors, and which he snaps in the air, empty, to prompt his herd to pick up their pace. He carries a slingshot over his shoulder, with which he can hurl rocks at any unwelcome visitors, and which he snaps in the air, empty, to prompt his herd to pick up their pace. Tibetans, Singhe says, believe that sheep were originally created in five colors, just like Tibetan flags – but when the original sheep were swept away by a river, only two survived. Guru Padmasmbhava – the founder of the Nyingma school of Buddhism – gave his blessings to the two sheep, so they would provide the basic necessities for Tibetan life. Tibetan sheep – both white and brown – have always been valued for their wool, which – since it helps the animals survive frigid, high-altitude winters – is legendary for its warmth. 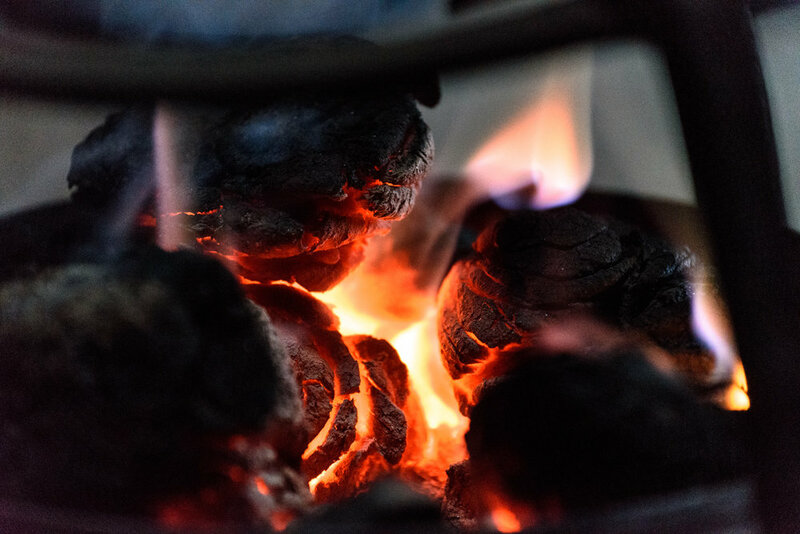 It was once woven into clothing and rugs, and was an important trading commodity – as was their meat. According to Dr. Brijesh Kumar, a veterinary scientist at the Indian Council of Agricultural Research, Singhe’s is the last herd of Tibetan Highland sheep in India. In the 1990’s, several thousand Dokpa-owned sheep were wiped out when they were taken to lower-than-usual elevations in search of fodder, but encountered "an abundance of poisonous grasses and died due to diarrhea and other diseases." Then, as Dokpa children were sent out of the mountains to go to schools and the size of families in the mountains shrank, some of those who remained felt too short-handed to manage the time-consuming flocks, so some began to reduce the size of their herds and a few gave them up completely. But most households kept some sheep until the 2008 ruling by the dzumsa, after which Dokpas gradually slaughtered their remaining sheep and smuggled the meat to Gangtok. Singhe was the last holdout, and he was prepared to get rid of his, too, until the Government of India stepped in. Concerned that the country would lose this breed of sheep completely, and forever, the government offered to pay him a salary of 6000 rupees each month if he would hang on to his herd. He takes just enough milk from them to make tea, as it’s too much work for him to milk them all, and he earns about 450 rupees per kilogram for the wool he shears each summer. Check out the coat on that sheep! Thanks to mediation efforts by Dr. Kumar, Singhe has also received permission from the dzumsa to sell a handful of sheep each year at fair market rates, as well as to slaughter a few for his own consumption. Though he needs the meat, he refuses to wield the knife himself. “My sheep feel like my relatives. I can’t kill them,” he says. “When one is slaughtered, I chant and make puja, lighting butter lamps and praying for the sheep, for myself, and for the world.” Other Dokpa households follow a similar practice when they slaughter two or three yaks every December, which provides enough meat to last them the entire year. Believing it to be a sin for them to kill yaks themselves, they all hire Nepalis to do it, and hold ceremonies, praying that the yaks will be reborn in human form in their next lives. But Singhe is happy with his life. “Sheep bring good luck to the world, and they’re an important part of nature,” he says. “So I feel like I’m doing something important by keeping them.” Dr. Kumar says that Singhe sees the sheep as "the connecting link between him and God." In the month of May, Singhe has the meadow at Phalung all to himself. In June, other Dokpa families arrive, and in July an important religious festival is held there, for which Dokpas from around the region gather. Marking the date when Buddha gave his first sermon, at Sarnath (near Varanasi), the highlight of Drukpa Tseshi has long been the yak races, but this sport has reportedly been banned by the local Rinpoche, who has decided it is a form of animal cruelty and violates Buddhist principles. Dokpas still participate in other competitions, such as stone-throwing and tugs-of-war. Dances are performed and prayers are offered to protective spirits who live in the mountains. "Every morning we pray from our hearts to all living things. We pray for peace, and so the next life for all is better than this one. We pray for all of the world, and all of the animals," says Samten Doma. In the fall, Singhe and the other families, including his father, leave the Phalung area and move toward the areas around Tso Lhamo and Gurudongmar – two of the highest lakes in the world, situated at 17,485 and 17,800 feet above sea level. Set within a broad basin along the uppermost part of the Teesta River, the landscape is much more expansive than in the sharply-cut valleys where they spend summers; though walled to the south by the Kangchengyao massif, the terrain to the north opens onto the vastness of the Tibetan Plateau. 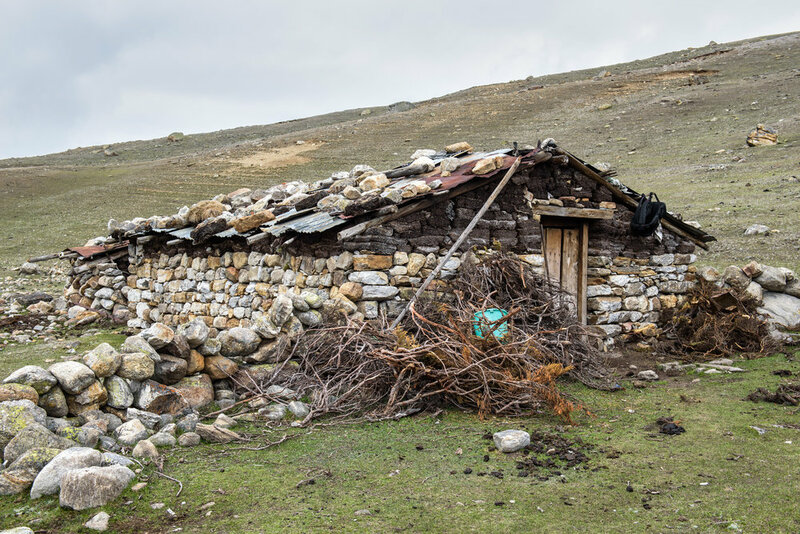 Most Dokpa families have two huts in their winter range and spend a few months in one before shifting to the other. None use black, yak wool tents anymore; they’re too much trouble to move and erect with so few helping hands available. Though this is peak season for yak sales, the number of sales any one family makes can typically be counted on one’s fingers. The Dokpas’ overarching focus is survival, for both themselves and their animals. Because grass is so sparse, the yaks produce less milk, so people take only what they need to make tea, while the rest is left for the calves. Herding requires much more effort than in the summer pastures, where the yaks can be left by themselves for days at a time. In winter, the Dokpas have to stay with their yaks all day long, accompanying them as wander and graze, from the time the pens are opened in the morning until they return in late afternoon. It’s exhausting, and is one of the reasons why leaving the mountains is an increasingly appealing option. “We’re getting too old for this,” said Dugya, about life in winter. Without the Dokpas’ constant supervision, it’s likely that yaks would stray into minefields; even with it, yaks die each year after encounters with ordinance. According to Dokya, explosions happen often. Another Dokpa, named Ngodup, who is fifty-eight, said sixteen of his yaks had been blown up, so he moved – as did several Dokpa families who were tired of losing animals – a short distance southwest, to the Muguthang Valley, where they migrate between a handful of huts all year long. According to the Tibetan Welfare Officer based in Gangtok, “Muguthang is filled with the smell of flowers in the spring, and you can see the snow peaks, and the sky is turquoise-blue…It’s so beautiful that you want to cry.” Ngodup agrees, saying he feels deeply connected to the valley and doesn’t want to leave it, even though his wife and children live in Gangtok. His wife, he says, is Tibetan but not Dokpa, and runs a small shop in the city. Neither she nor their kids have ever been to Muguthang, “and aren’t even curious about it.” But he will try to stay there, with his yaks, as long as he can. “I love my yaks. I feed them when they are small. I care for them when they are sick….That is my life,” he says. But even in Muguthang, life is not without risk: heavy snowfalls can trigger avalanches that bury yaks – and the grasses that they need to survive. There, of course, are a few complaints in Yak World about the army. Soldiers stationed in Muguthang, it is said, will help themselves to yak dung without permission, sometimes creating fuel shortages for the Dokpas. 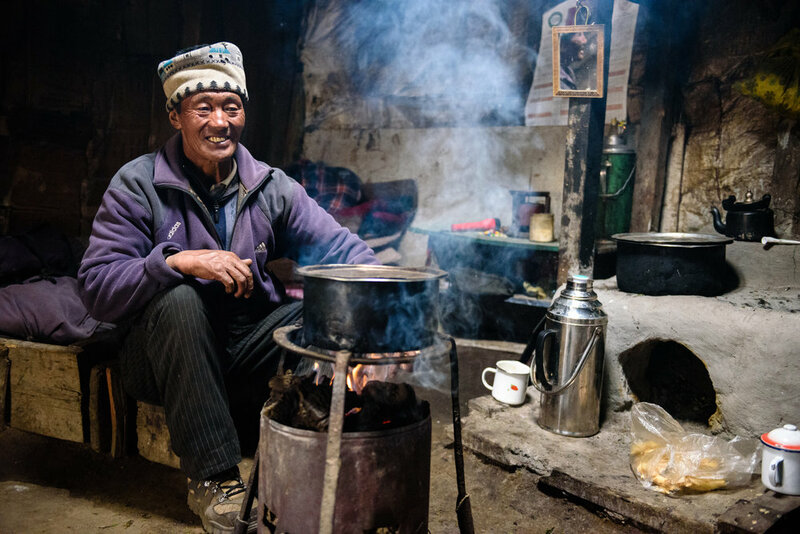 “There are times when we don’t even have enough dung to boil milk,” reports one Dokpa from Muguthang. And the army bears some of the blame for the disappearance of purebred Tibetan mastiffs from Dokpa culture. A Dokpa mutt. Most families no longer keep dogs at all. Once, every family had mastiffs – huge, hairy dogs weighing up to 200 pounds, with leonine manes and a fearsome set of teeth – which protected them and their herds. Today, none remain. Apparently, an army major once stepped on a mastiff’s tail, and was so badly injured when the dog (or a group of dogs, depending on who’s telling the story) attacked him that he had to be airlifted to a hospital. According to Sonam, the army then “chased away or killed” the Dokpas’ dogs, to the great distress of their owners. Even if they weren’t too afraid to replace them, the Dokpas have no way to do so, since the dogs came from Tibet and aren’t easy to find in Sikkim. Still, the army is generally regarded favorably by the nomads. The same can’t be said for the so-called ‘army dogs.’ Descended from the pets once kept by soldiers, these packs of feral dogs survive on trash from the military bases and take to the hills to hunt. Aside from killing wildlife, including endangered species such as Himalayan blue sheep, red pandas, and wild asses, they also take down young yaks. Ugean, the elder from Nyima Ten, calls them his biggest problem, saying he lost twenty calves to army dogs in 2016. “I want to poison them,” he declares, though he normally wishes animals no harm. Dokya lost a handful, too. And Ngodup, from Muguthang, says frequent dog attacks were one of the factors that convinced him to abandon herding sheep. 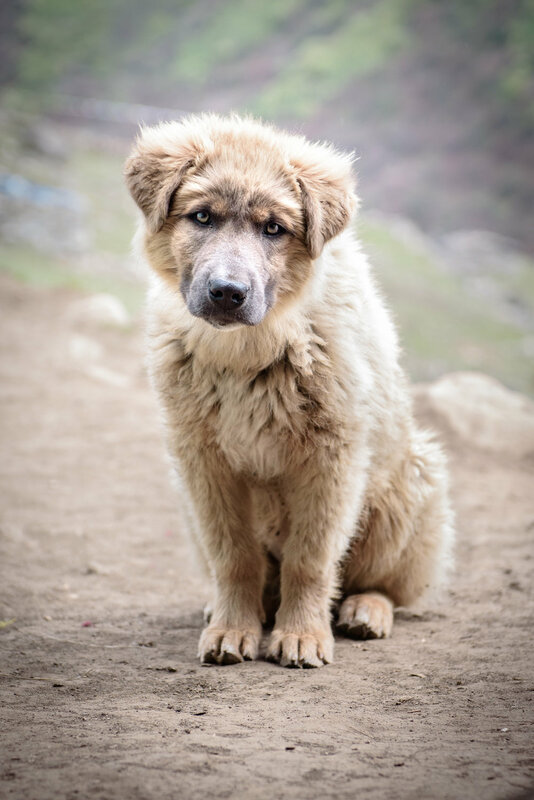 Though the Sikkim Anti-Rabies and Animal Health program has initiated sterilization efforts in the area, the dogs are difficult to catch and the terrain poses many challenges, making for slow progress. For now, they seem like one more difficulty to which the Dokpas must adapt, or at least endure, as they continue to live with their herds in the thin Himalayan air – some remaining there by choice, others because they haven’t yet been able to leave. If there’s one Dokpa who represents where the nomads are now, and where they’re heading in the future, it might be a twenty-one-year old from Muguthang. 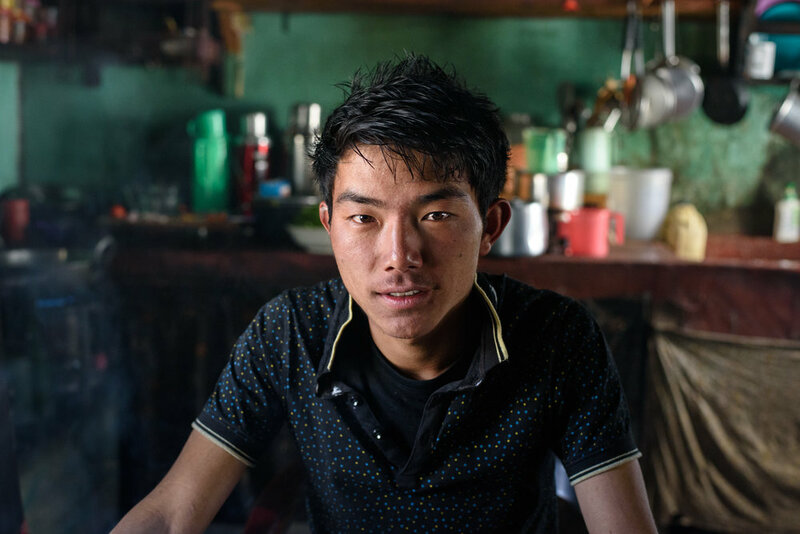 Tenzing Lhundup spends summers helping his mother herd yaks and winters in South Sikkim. His father died when he was young, and he was sent to school as a child. One of his sisters is a hotel manager in Mumbai, while the other has stayed in the mountains. He likes life in Muguthang. “The milk products are pure, you get to ride around on yaks, there aren’t many people, and it’s a very peaceful, beautiful place.” But he feels like it’s not for him. Beyond the sparse selection of spouses, Tenzing feels like the Dokpas way of life is an anachronism to which he doesn’t truly belong. He plays only western guitar, never the traditional Tibetan damyen, and his favorite singers are Justin Bieber and One Direction. “It’s a generation thing,” he says. When he’s in Muguthang, he misses having the mobile network that’s an integral part of his life in South Sikkim. But even if he had phone service there, he doesn’t think he would want to stay. Pema Chorden in her hut at Yangdi, north of Thangu. 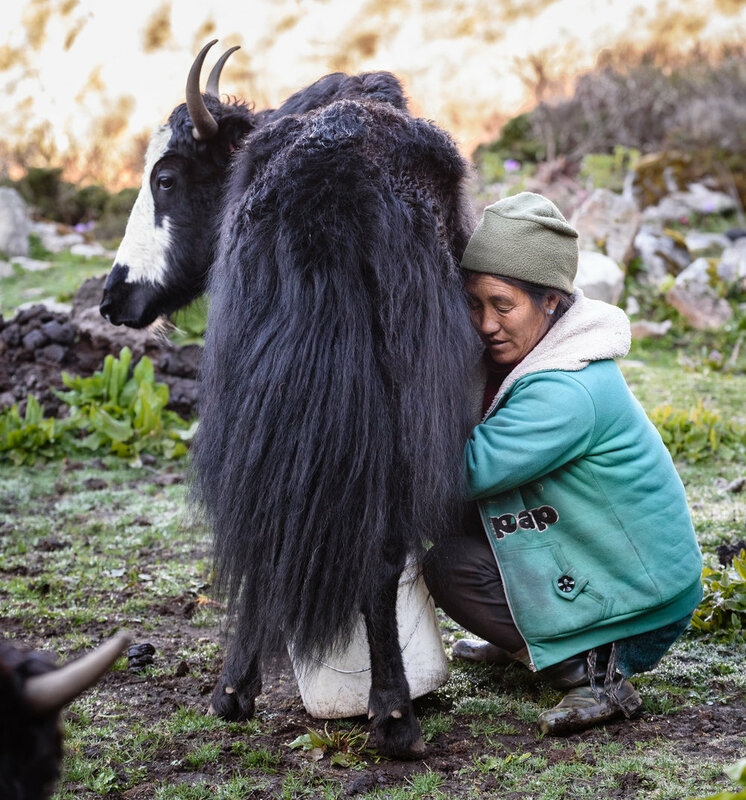 Pema Chorden wants to sell off her herd of about 80 yaks so she can settle in Ravangla. Four of her children already live there, and the one daughter that remains with her in the mountains is eager to leave them behind. Sitting beneath a tree in Gangtok’s main market area, one of the brothers of Sing-ge the sheep herder explains why he left the mountains to open a shop in the Sikkimese capital. “It’s very hard keeping yaks,” says Thea Cheuang and, laughing, adds, “And eventually, the people who stay with yaks become dumb like them!” He mentions that the Dzumsa’s price-fixing convinced him that the herding life was no longer worth it, and he hated killing yaks. “Even though someone else did the actual slaughtering, I always felt it was a sin.” He prefers city life, pointing out that, “around Thangu, there’s basically potatoes and dal, but in Gangtok, you can eat anything you want.” Still, when he sleeps at night, he often dreams of yaks and moving around with them in the high country. They are good dreams, he says. We owe several people such sincere thanks for the help that they gave us that it's hard to know with whom to begin - so let's just begin at the beginning. From the nascent days of this project, when it was just a spark of an idea, Gangtok-based journalist Pema Wangchuk offered us encouragement take it on - and once we got to Gangtok, he generously shared his knowledge of Dokpa culture and the many issues that the community faces today. He also connected us to Dr. Anna Balikci Denjongpa, at the Namgyal Institute of Tibetology, who spent years working on a documentary film about the Dokpas. In addition to talking with us on a few different occasions, she gave us an advanced screening of the film, and has allowed us to include clips from it in this project. You can watch the entire documentary for free on YouTube at Drokpas: The Yak Herders of North Sikkim, and see the institute's other films at the Sikkim Video Archive. 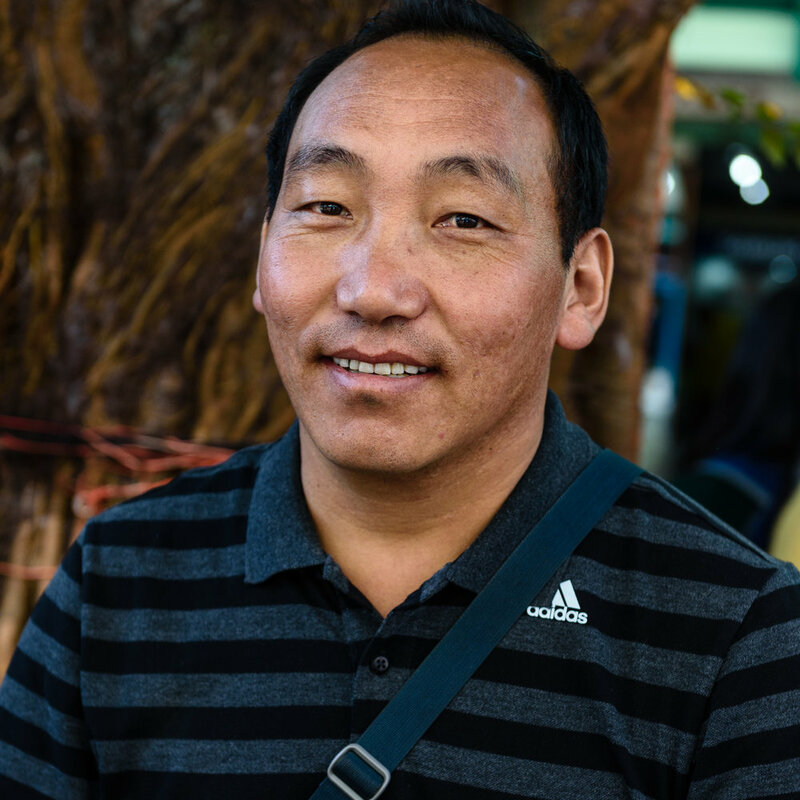 On a daily basis, no one was more helpful than Dorjee Wangdi Bhotia, our driver and guide, who embraced everything with enthusiasm, from dealing with our permits to buying supplies in the market to trekking for days at high altitudes with a heavy pack. We were incredibly lucky to connect with him. The Tibetan Settlement Office in Gangtok gave us a hand in reaching Dokpas in Ravangla. Dr. Brijesh Kumar, of the Indian Council of Agricultural Research, helped clear up a number of questions we had about the Dokpa's herding of Tibetan sheep. Santiago José Carralero Benítez, of YURTA Association, offered important background information on Tibetan yak herders; researcher Tenzing Ingty was kind enough to reply to my email queries about his work; and Ritesh Tiwari sent photos of Muguthang, where he is stationed at an army base, and which is currently very difficult to get permission to visit. The publication Yaks On The Move, by The International Centre for Integrated Mountain Development (ICIMOD), was a valuable resource, while the information on yak anatomy and domestication came from a paper by the Food and Agriculture Organization of the United Nations. Of course none of this would have been possible without the welcome we received from the Dokpas we met, whether up in the mountains or in Gangtok or Ravangla. Thank you for sharing your world with us! 1. There are a handful of other yak herding families in other parts of Sikkim who are also often called Dokpas, but who are not Tibetan and have different cultural histories and practices, so we have not included them in this project. 2. While some papers - based on research conducted in the 1970s - claim that there are Tibetan sheep in the Indian state of Arunachal Pradesh, Dr. Kumar says definitively that there are no longer any Tibetan sheep there. He says that there are some similarities between Arunachali sheep and Tibetan sheep, but that "there are very remarkable points of Morphometric differentiation." 3. Different English spellings are frequently used for some of the names and places mentioned here. We opted for the ones that seemed most common, but you may see the same names / places spelled differently elsewhere. Michael Benanav is a writer and photographer for The New York Times, The Christian Science Monitor, Sierra Magazine, Geographical, and other publications. He's also the author of three books, most recently Himalaya Bound: One Family's Quest to Save Their Animals - And an Ancient Way of Life, which follows a family of nomadic water buffalo herders on their annual spring migration into the Indian Himalayas. His images have been featured in National Geographic books, on CBS's 60 Minutes, and in exhibition at the Indira Gandhi National Centre for the Arts in New Delhi. To see more of his work, visit his website at www.michaelbenanav.com. Monika Agarwal has been supporting pastoralists and their organisations in India and outside for over a decade. Currently she is anchoring the national survey on pastoralism at the Centre for Pastoralism. She is a Board Member at Senaapathy Kangayam Cattle Research Foundation (https://www.kangayambull.com/). In the past she has supported International Land Coalition (ILC) in India, the global secretariat of World Alliance for Mobile and Indigenous People (WAMIP), and the regional chapter South Asian Pastoralist Alliance (SAPA). She represented pastoralist constituency as the Steering Committee Member of Livestock Environmental Assessment and Performance (LEAP) Partnership, UN FAO in 2014-15. She is also an MBA in rural management from the Institute of RuralManagement Anand (IRMA), India. Traditional Cultures Project is a 501(c)3 non-profit organization that produces online multimedia documentary stories about traditional and in indigenous communities around the world, inspiring an enduring sense of wonder and respect for the myriad possibilities of what it means to be human. Please support our work! Visit the 'Donate' page on our main website and help us continue bringing these projects to the web, where anyone with an internet connection can see them for free!